Xunlei is a file sharing client that supports BitTorrent, eDonkey, Kad, and FTP. 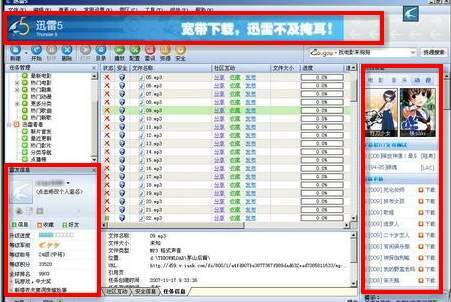 It is said to be faster then other popular bitTorrent clients such as bitComet and uTorrent. I usually use it for downloading drama episodes through torrent and ftp. I like using Xunlei (Thunder) but the problem to me was that it contains too many distractions and ads. A fresh installtion of Xunlei will look something like the picture below whereby boxes in red are ads and Xunlei community news. The following tips will teach you how to remove all of those bothering contents. Shut down Xunlei (Thunder) if it’s already running. You can stop getting ads on the top header section of Xunlei by doing this. That section will still show but there won’t be any ads in it anymore. Open C:\Program Files\Thunder Network\Thunder\Program\Ad, delete all files except 002.gif, main.gif, new.gif, default_main.swf and default_new.swf. Then open C:\Program Files\Thunder Network\Thunder\Program, find gui.cfg and edit it with notepad so that the following settings refers to empty strings. This is probably the most requested part to be removed in the application. Edit the last line so that you get Pane1_Hide=1. That’s it. Now run Xunlei (Thunder) and you will see that all the right hand sidebar contents are now gone (it’s actually hidden)! If you want them back, just change the previous setting back to 1. Chances are you don’t even have an comunity account since you’re just using Xunlei(Thunder) for downloading stuffs online. This is easy as you can just use the shortcut key ALT+V+U to remove that section. This is really another annoying part of the program. Goto Options (ALT+O), Advanced, and untick the following boxes labelled in red so you won’t see them again. When I install Xunlei 5 and delete all the adv and change to English. There is a bug come out and running on the screen and become bigger and bigger. At first I think it is a real but when I press it on the screen, it disappeared. Is that a joke because it sounds like one. I’m using Xunlei 5 and can’t find a bug that grows bigger and bigger. Have you tried it without installing the english translation pack first? May I know where did you get the english translation pack from? 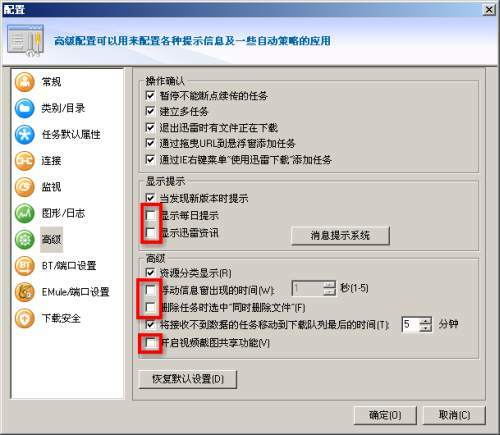 dear sir, how do i remove the xun lei program from my pc? I go to control panel but can’t remove it as the remove button is not high-lighted (disabled). That’s funny. You’re right, usually you can just uninstall any programs from the control panel. Do you have a screenshot of your “remove button not highlighted” problem? I tried all the steps that has described above, but i’m still getting pop up ads.. Pleaseeee help me……. It’s been a long time now since i’ve used xunlei and they probably have a newer version since this article was written.